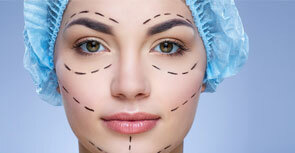 Cosmetic surgery aims at aesthetic enhancement of your face and body. Our Face is our introduction to the world. There may be some facial features which do not allow our face to be in balance. These slight imperfections may be due to factors such as birth defects, genetics or an accident. Another factor is age. As time passes, changes occur in our face. These changes are usually gradual, but one day, we might take a look in the mirror and find a different face than the one we saw years ago. Cosmetic surgery procedures can bring harmony to your face and in the case of time, turn back the clock to restore a youthful appearance. A great body can't always be achieved through diet and fitness alone. Heredity, weight fluctuation, pregnancy, stress and aging can influence the shape and tone of every body zone, from arms to tummy, hips and thighs. Various cosmetic procedures can correct and enhance your body to bring your body into balance and lead to an increase self-confidence. At MedSpa, we use the latest and most innovative techniques available in the world; from minimally invasive and endoscopic surgery for the face to total body contouring and body lift procedures. Cosmetic surgery help in restoration of your looks which may have been affected by age or accidents, to correcting birth defects or to just improve and enhance the beautiful looks you have. Contact us anytime with any questions you may have, or to schedule your confidential consultation for cosmetic surgery in Delhi at affordable cosmetic procedure cost in India by specialist cosmetic plastic surgeon Dr. Ajaya Kashyap in India.